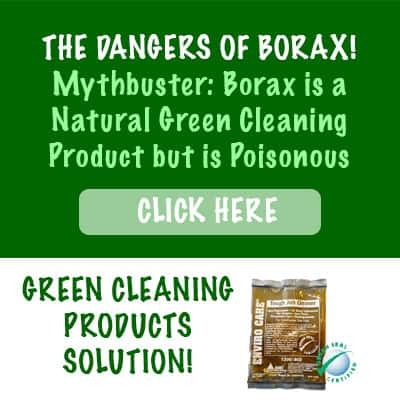 Mythbuster: Borax, although considered by many to be a green cleaning product, is actually dangerous in some cases. Borax is often listed in recipes for natural green home cleaning. It may work, but it if the purpose is for a safe, green clean it is important to know that borax is just as frequently listed as a poison that is designed to kill. Your grandmother may have touted the wonders of natural green home cleaning techniques. Now that you care about green cleaning products, you are going back to her formulas. But you may be wondering, was Grandma right? Borax is one such cleaner that has the sort of “Grandma blessing” because it has been around for so long. 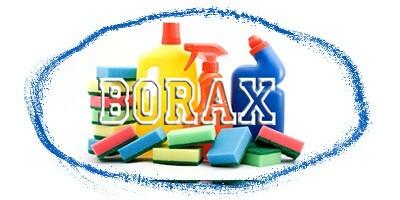 In addition to its cleaning reputation, borax is flaunted as a natural pesticide, fungicide, and even a herbicide. (Although plants need boron, too much of it will kill them, so borax is also used as an herbicide.) Note any word that ends with the phrase “cide” is dangerous. It originates from the Latin word caedere meaning to kill, just like homicide, genocide, and suicide. It is for this reason that the government lists borax as a poison. The FDA has banned borax as a food additive, and the European Chemicals Agency added it to their “list of substances of very high concern” a few years ago. Additionally, the European Union declared borates, including borax, to be reproductive toxins. The EPA also has found that borax has been linked to hormone disruption. Hormone disruption is technical lingo in reference to potentially causing sexual health issues. In this case it can be harmful for both male and female reproductive systems. Despite the fact that borax is often identified as one of the key green cleaning products to use in natural green home cleaning, it really is not a healthy, eco friendly alternative you may expect it to be. If this bad borax news is new to you, you’re not alone. Many recommend borax as a green cleaning ingredient. On the other hand, since borax has also been hailed as a roach killer, I avoid it. Additionally, it is clearly is to your benefit to also shun the traditional cleaners because they do contain unnecessarily harsh and potentially harmful petrochemical based synthetic ingredients. For green cleaning products options that ARE SAFE and NONTOXIC, try the EnviroCare product line, such as Tough Job.